In 2016-2017 alone, Lafayette Instrument Company has supported customers from over 80 countries and every US state. We are proud of the company that we have become, but our footprint was not always so large! When Max Wastl was 16 years old, he immigrated from Germany to New York. He had lost his father in the late 1930's, and his family hoped that the US would live up to its reputation as the land of opportunity. Soon after Max's arrival in the US, he secured a position at Sound Apparatus and he later went on to study Electrical Engineering at the prestigious Purdue University. Despite his limited knowledge of the English language, and no formal education, he managed to excel in his studies. In 1947, Max obtained his degree in Electrical Engineering and went to work for a national firm. Max's education, experience, and ambition gave him the confidence he needed to venture out on his own as an inventor and entrepreneur. Lafayette Instrument Company (LIC) was established in 1947 with its one employee and an 8 x 10 foot shed for a workshop. (The company's name paid homage to the city that had nurtured Max.) The fledgling company quickly expanded and required increasingly larger facilities and, under Max's leadership, Lafayette Instrument quickly became the market leader in psychophysiological instrumentation for schools and university laboratories. This statement underscores the company's devotion to its customers and to understanding the ingredients needed for long-term success. In 1965, Lafayette Instrument Company relocated to its current location at 3700 Sagamore Parkway North in Lafayette, Indiana. Between 1965 and 1975, three expansions were made to accommodate sales growth, new products, new machinery, and new employees. In 1968, the company began to explore the sports editing market while sales of physiological recording instrumentation and related psychology testing apparatus remained strong. Four years later, with more than 25 years of instrumentation experience in the manufacturing of research quality physiological recording systems, Lafayette Instrument Company introduced their first "Examiner's Polygraph" in August, 1972. The first instrument was heavily influenced by the examiners who conducted field tests. This approach still applies today; the design of latest Lafayette Polygraph reflects the current needs of experts and professionals who depend on state-of-the-art equipment. Lafayette Instrument Company was a market leader when the world entered into the age of the computer. As the technology available for design, development and manufacturing advanced, so did LIC processes and products. In 1993, Lafayette Instrument Company sold its first computerized Polygraph. By 1997, the company had fully embraced modernization via computerization, demonstrated through its new line of physiological recording instrumentation (DataLab) and its behavioral control and monitoring system (ABET). In 2004, Lafayette Instrument Company successfully acquired a controlling interest in MindWare Technologies, Ltd., a Columbus, Ohio based Software Development Company. MindWare brought a wealth of experience to solving researcher's complex computer based data acquisition and analysis needs. MindWare had over 40 years of real-world engineering knowledge in both industry and academia. A partnership remains today to leverage MindWare's presence in the academic and medical research communities for designing, developing and manufacturing products for the Psycho-physiology Scientific Research market. In late 2006, Lafayette Instrument Company purchased Acumar Technology, formerly of Portland Oregon, and the rights to the Acumar product line. The Acumar is the only digital inclinometer listed in the 5th edition of the American Medical Association's guide. 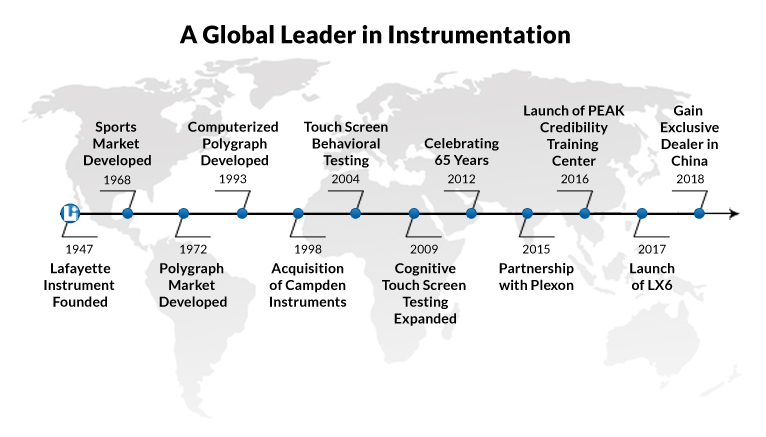 In late 2015, Lafayette Instrument entered into a partnership with Plexon Inc. Plexon is a pioneer and innovator of custom high-performance data acquisition, behavioral research, and analysis solutions. Together with Plexon we are working to provide the highest quality integrations of data acquistion software and behavioral research hardware. In April 2016, Lafayette established the PEAK Credibility Assessment Training Center. PEAK is a training facility located in Cape Coral, FL and is under the guidance and leadership of Ben Blalock. Our mission is to provide governments (federal, state and local) and private individuals with the highest quality credibility assessment training and consulting services available. We will help our students utilize best practices and leading edge scientific procedures. 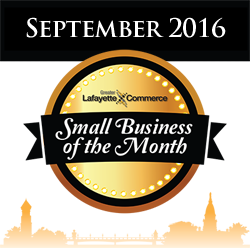 In September 2016, Lafayette was awarded the Greater Lafayette Commerce Small Business of the Month Award. We are proud of our employees and thankful to the GLC and our customers for making this honor possible. Lafayette Instrument Company has evolved from the vision of one gifted young man into a skilled and highly capable team of Engineers, Designers, Technicians, and Production personnel, backed by first-class Administrative, Sales and Marketing, and Order Processing teams. It is the talent and commitment of LIC employees, dealers, and partners that enables Lafayette to continue innovating and delivering quality instrumentation to Life Science, Evaluation, and Polygraph professionals. We have had over 75 years to learn from and serve our clients, and we are committed to continuing these traditions that were established by our founder.